Within the first few minutes of the BBC drama Happy Valley, we learn that Sergeant Catherine Cawood is divorced, living with her sister (a recovering heroin addict), raising her grandson, and is the mother of two children: one is dead and the other doesn't speak to her. With all that drama, you'd be forgiven for expecting Catherine to be somewhat depressed, but nothing could be further from the truth. She's a no-nonsense, organized woman who likes nothing more than diving in among the "scrotes and numpties" on her beat and straightening them out (with force, if necessary). That is until she learns that Tommy Lee Royce has been released from prison and his back in her town. Royce is the man that she blames for the suicide of her daughter and the man she fears is her grandson Ryan's father. She becomes obsessed with finding him (he doesn't seem to be staying with his drugged up mother) and keeping him away from Ryan. At the same time, in a very "Fargo-esque" plot, accountant Kevin Weatherill is desperate for money. His wife is suffering from MS, and he's in need of money to pay his daughter's school fees. Since his father was (to his mind) cheated out of a partnership in the business where Kevin works, he feels he's entitled to a raise from the boss Nevison Gallagher. Gallagher says he really can't agree to a raise, since he'd have to give a raise to everyone. Furious, Weatherill approaches a local dodgy character he knows named Ashley Cowgill with a business proposition: a plot to kidnap Gallagher's daughter Anne and split the ransom money. What could possibly go wrong? After the kidnapping plan has been set in motion, Weatherill receives all sorts of bad news. Gallagher's wife has cancer and is not expected to live long. As a concession to his wife and daughter, Gallagher announces he's not going to give Weatherill a raise, but he will instead fully pay the daughter's school fees. Humbled and chastened, Weatherill attempts to call off the kidnapping plot, but of course, it's much too late. As the events spiral out of control and more crimes connected to the plot occur, Weatherill watches helplessly and rehearses what he'll say to Gallagher and/or the police if his part in the kidnapping is discovered. Naturally, the evil Tommy Lee Royce has gotten wind of the fact that he might have a son, and takes to hanging around Ryan's school. To further complicate Catherine's life, her ex-husband has lost his job and has started coming around again. He remarried after his marriage to Catherine broke up in the wake of their daughter's suicide and her determination to raise Ryan rather than put him into care. After Catherine suffers horrific injuries on the job, she begins to spiral into depression. Ryan is a constant source of worry and trouble both at school and at home. Her son is still not speaking to her unless absolutely necessary. Her sister shows no signs of moving out (although it's hard to see how Catherine would cope without her). Her superiors in the police force seem to show no interest in tracking down Tommy Lee Royce. A tragedy occurs to one of her subordinates and she begins to question her entire career. There are plenty of terrible and heart-wrenching scenes in the series, making you wonder why the town council in "Happy Valley" hasn't voted on a more appropriate name for the town. Drugs and crime are rampant and everyone seems pretty miserable. Good thing they have a resilient and dedicated cop like Sgt. Cawood on the job! I was pleased to see that Happy Valley and actress Sarah Lancashire were big winners at the recent TV Choice Awards. 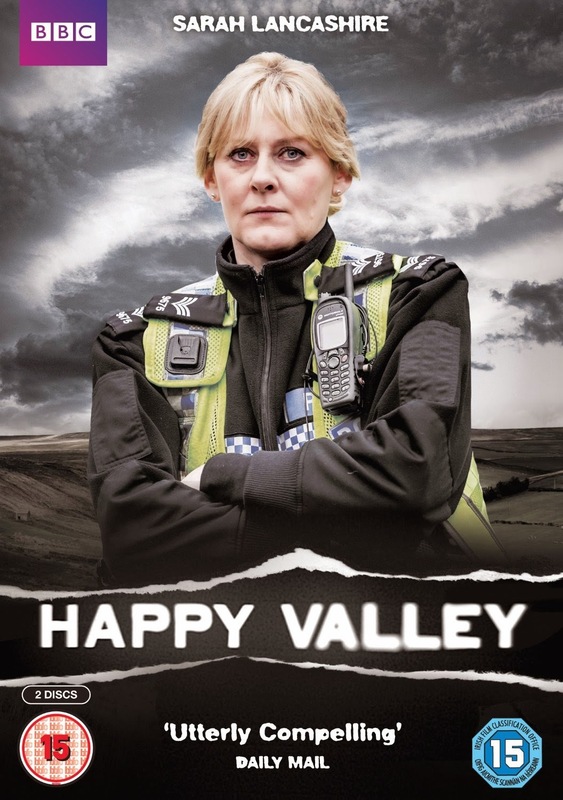 There has been some speculation that there might be a second series, so I'll be on the lookout for the further adventures of the glum populace of Happy Valley. Although I couldn't wait and ordered the DVD, it is currently available as a streaming option from Netflix.